HONEY, I SHRUNK THE RINK. No, Rick Moranis hasn’t taken over minor hockey in Canada. But, the powers that be in Canadian community hockey have taken a page out of Honey, I Shrunk the Kids — the 1980s feature film in which Moranis starred as a residential inventor/scientist whose kids are unwittingly shrunk with a home-built shrink-ray. The move by Hockey Canada and its provincial partners has effectively cut the rink in half, and in some cases into thirds, for entry-level players just getting started with skates, sticks and pucks. The standard ice surface is divided up, and skills-development sessions and scrimmages are played cross-rink on the rink divided into thirds, and lengthways — from the centre-line in — on each half. Initiation-aged kids (ages 5-6) played last season on rinks divided into thirds and played cross-ice. This season sees the half-ice playing surface move to Novice (ages 7-8). Various regions are currently in different phases of the rollout, with B.C. dropping the puck on its third season of smaller ice for little people, while Ontario is entering Year 2. Flexibility in the program allows the provinces to work within the new national framework while adding their own touches to it to suit their needs. Some provincial associations will “graduate” Novice-age players to full-ice midway through the season, once they’re ready. Other variants may include minor and major categories in the early-development age groups, where you might see entry-level kids moving up from cross-ice to half-ice surfaces because they’re good to go. All these choices, and more, are available to the provincial associations within the national framework developed by Hockey Canada in consultation with its provincial partners. Options are good. Hockey Canada’s goals for the shift to smaller ice are simply to increase enjoyment, engagement and participation in the game for very young, entry-level players. As with all significant changes in Canadian organized minor hockey, the transition wasn’t immediately embraced by the adults in some circles. But, with a season of Initiation completed on the smaller surface, the returns are demonstrably positive across the country. Remember, Carson is talking about hockey for little people aged 5-8 — the majority of them beginners. The need to hot-house them, to coach them to play to win, isn’t as acute at this level as it is to put them out there to participate and explore their budding creativity in an activity that is brand-new to most of them. — The Initiation Program is a progressive, learn-to-play teaching curriculum. Children learn through participating in practice drills and informal modified games. — The program consists of four phases of instruction, designed for any entry-level hockey player, which introduce the skills of skating, passing, puck control and shooting in a progressive, one-step-at-a-time manner. — A comprehensive program for the development of young children as hockey players. — The focus is on skill development and fun without the pressures of winning. — It aims to create participants and instructors who will continue in the game. — The motto is Fun, Fitness and Fair Play. — Hockey Canada developed the program to ensure that a child’s early experiences with hockey are delivered in a safe and positive experience. — The program enables participants to become contributing members of a team effort, develop self-confidence and experience a sense of personal achievement. — To have fun while playing hockey and engaging in physical activity. — To learn the fundamental skills required to play the game of hockey. — To develop and refine basic motor patterns. — To be introduced to the concepts of co-operation and fair play. Count the Ontario Minor Hockey Association (OMHA) as a significant and successful participant in the move to the smaller ice surface. With 90,000 kids aged 5-20 playing organized hockey in 28 leagues spread across 223 local associations under what is claimed to be the world’s largest regional minor-hockey umbrella, the OMHA provides a cavernous petri dish in which to conduct this latest hockey experiment for entry-level kids. Of the association’s player total, 29,462 players participated at the Initiation (5-6 years old), Tyke (7 years old) and Novice (8 years old) levels in 2017-18. “Overall, it went off. It was well received,” OMHA executive-director Ian Taylor says. “A lot of associations were already playing games on modified ice. It wasn’t like starting from scratch. In an established program like the OMHA — which began in 1935 and has turned out game-changing players such as Wayne Gretzky and Bobby Orr — change doesn’t always come easily, particularly for some of the adults, at least. However, with challenges come rewards. If rekindling interest in grassroots hockey and retaining entry-level kids are the goals, recent Ontario enrolment numbers reveal a telling story. An Aug. 13 press release from OMHA media-relations official Joe Roma indicates an immediate and demonstrable spike in Initiation hockey participation. In the inaugural season of cross-ice Initiation hockey for kids aged 5-6, in 2017-18, there was a 35 per cent jump in registration over the 2016-17 season in Ontario. With Alberta completing its first season of shrunken ice at the Initiation (5-6) level, the official introduction of Novice half-ice games isn’t due until the 2019-20 season. But that isn’t keeping the provincial association from allowing its community partners to get the jump on the new Novice model. With the Initiation transition set, and Novice now in a flex year, Alberta’s regional hockey centres have the freedom to devise the best way to get the Novice plan rolling, ahead of total implementation in 2019-20. 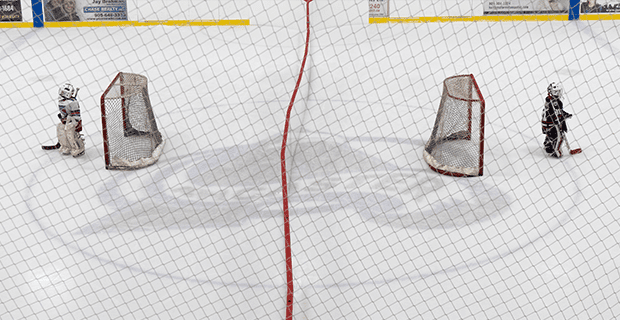 Some associations may put all their Novice kids on to half ice, others may decide to put first-year Novices on half ice, while second-year Novice players who’ve already been playing on full ice continue to play on the full rink. Fesyk was in the room with hockey officials from across the country as Hockey Canada enlisted the support from all regions to assist with the design and implementation of the small ice-surface model for entry-level kids. He admits he was skeptical at first of the proposal to mandate smaller ice surfaces for entry-level little people. Then he saw it in action. “There were some things that I wasn’t a 100 per cent believer in, until I saw it. You can see it on paper, you can have your own personal beliefs, and those are based on your own experiences, right?” Fesyk says. As a hockey dad, Fesyk expects to get a full report from his little players, who are jumping right into the middle of the shrunken-ice transition. Remember, the emphasis is on participation, encouragement, fun — and learning how to play before learning how to play to win. Mission: To create positive opportunities and experiences FOR ALL PLAYERS through innovative leadership and exceptional service. Entering Year 3 of shrunken-ice hockey for youngsters, B.C. is ahead of the pack in implementing Hockey Canada’s program. They’ve taken notes and assembled a dossier on the transition so far, and are pleased with the results. “Our biggest learnings have been two-fold,” says B.C. Hockey CEO Barry Petrachenko. “The benefits that our experts and research told us that would be a part of this seem to be correct — seem to be there. We have seen anecdotally that parents, coaches and administrators all feel and understand now this many years in that this is the way to go — that this is the way we should be teaching hockey. The second takeaway for B.C. Hockey and its member associations is that change is a challenge, both for the administrators introducing the change and the constituents asked to embrace it. Taking something as established as entry-level minor hockey and retooling it, significantly as some insist, can be a daunting endeavour. There will be differing points of view, even dissent in some cases, along with acceptance. “The people who felt that this system was taking something away from their players were the biggest opponents,” Petrachenko says. “That’s the biggest thing. If you look at it from the standpopint of something being taken away, they take the attitude that this is better for the bad players, the less-skilled players. It’s not better for the best players. It all gets back to the age group. We’re talking about kids aged 5-8 playing hockey on a smaller ice surface. Is it more about getting them into the game, or about them being Jamie Drysdale from the first time they hit the ice? There will always be higher-skills kids right from the drop of the puck. And they will still be those high-skills kids once they graduate from Novice to Atom, Peewee and beyond. Remember — parents, players and coaches are still going to the same arenas serving up the same post-game hot chocolate in the same neighbourhoods as before. It’s just that the playing surfaces in those arenas have been reduced to account for the size and skill of entry-level kids aged 5-8. “What we’re finding with the kids is the enjoyment is up there,” Petrachenko says. “I think back to a story from the Yukon actually that I heard in our first year. The Yukon at the time had five teams in the Novice age group. The way they did it, because of their ice allocation, four teams would play against each other and one team would have a full-ice game every other weekend, or however the schedule worked out. When they had the full-ice game, the players didn’t look forward to it.They actually didn’t like it because they knew the one or two best players would dominate that game and they wouldn’t get to touch the puck as much. They wouldn’t have as much fun. I think back to that one as one that stands out. When young children enjoy doing something, they usually want to come back and do it again. If Hockey Canada’s goal with the move to shrink the rink was to increase participation by, and retention of, young hockey players, the early returns from its provincial member associations all point to success. 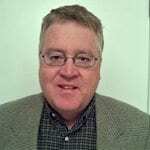 Has been working as an accredited sports journalist in Western Canada since the late 1980s -- including publications and news services in Castlegar, Medicine Hat, Vancouver, Cochrane and Calgary. Has written volumes on community hockey over that time, and watched the game progress at the community and elite levels. (Anyone remember wooden sticks, leather goalie gear and the first stretch pass they ever saw after the redline was removed from the offside equation?) There are countless great stories tied to the game of hockey, at all levels. It’s up to HockeyNow to bring those stories to you.